I got four orphaned projects done this weekend, three of which I found, but two only needed finishing work, and the third, I needed to finish the rest of of the project and finish it, but it was small. Here’s what I did. Shells: I had knit a bunch of theses shells, and got burnt out. I just needed to put them together. 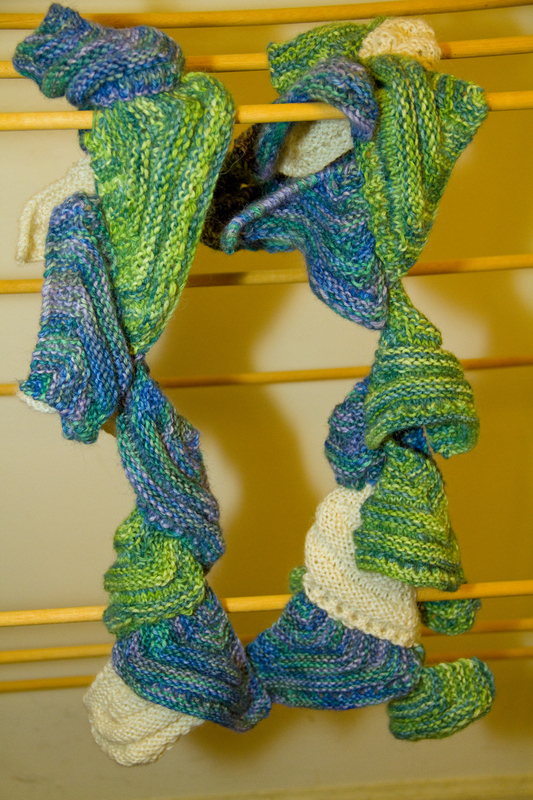 They turned out to be this curly, scaly, and utterly cool scarf. See the project details on Ravelry. Brought to You by the Letter “J”: I had started this a long time ago. I came across the half of the “J” that I found in a craft tool box. I needed to finish that. Googly eyes were a nice touch, and you can check out the pattern details again on Ravelry. Falling Waters Cabled Scarf: I got creative with the cables on this scarf I after I had accidentally threw out the pattern printout. Eh. You guessed it! You can find the gory details on Ravelry! Felted Bag: Another finished project that I buried in my piles under frustration. I dug it out, did a lousy job finishing it, but it’s done. I actually did do the needle felted flower on the purse. Do I even need to tell you? So, I accomplished something this weekend! Yay! Next Next post: Another WIP….done!